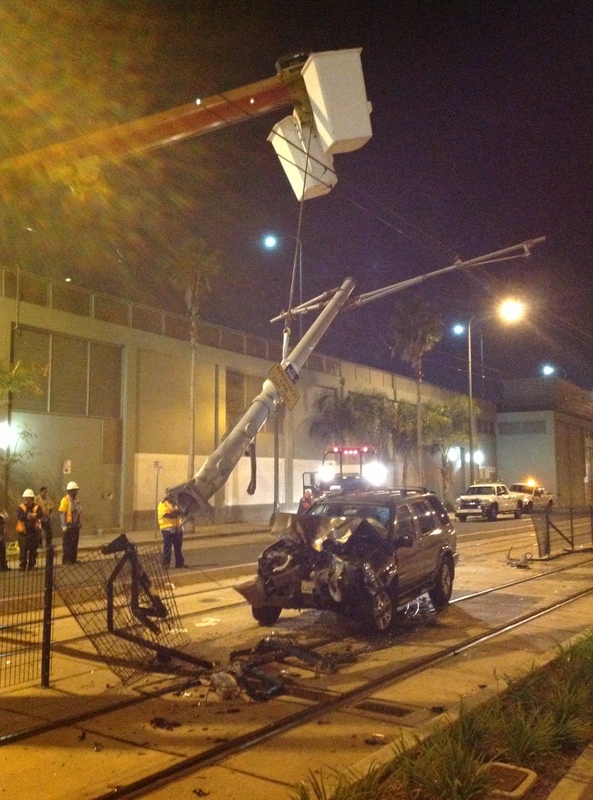 The pole was completely lifted from its support by the collision. Photos by Metro. Crew is suspending the power support pole in order to pull the car out from under the pole and tow it away. Lots happening here. The elevated crew is using a wire straightener to work out kinks in the overheard wire caused by tension from the impact. Crews directly underneath them are disassembling power support pole from support arms as the pole must be scrapped although the support arms were undamaged. 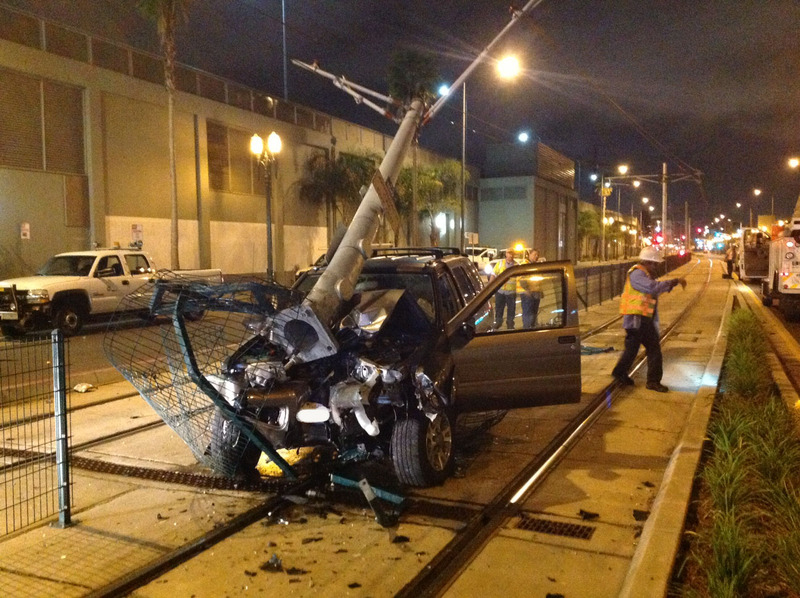 And the crew further down are working to replace train control signal heads which were sheared off by the SUV. 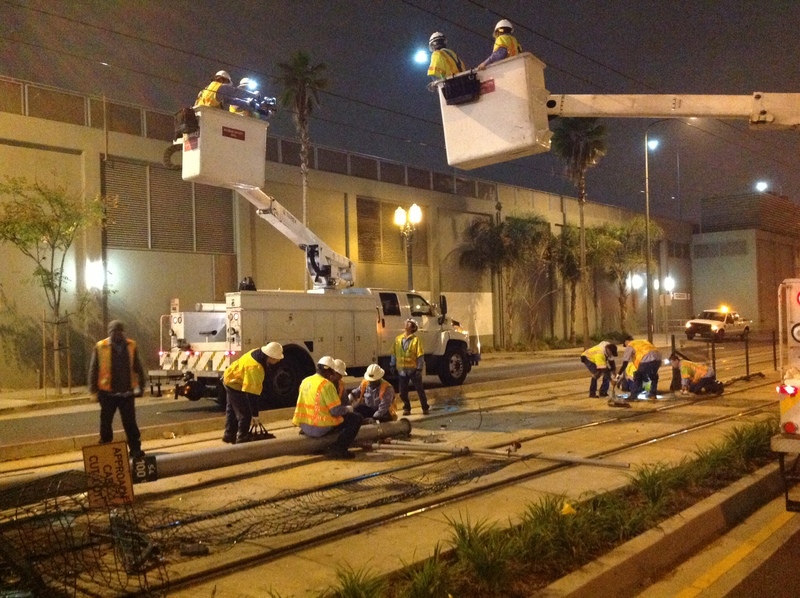 The Expo Line is running a normal Friday schedule today with minor delays around 23rd Street due to an accident Thursday evening in which a wrong-way driver on Flower Street struck and knocked over one of the poles that helps support the overhead wires that supplies power to trains. The pole still must be replaced. The above photos were taken last night and show the extent of the damage. The driver of the vehicle was arrested for suspicion of driving under a controlled substance, according to the Los Angeles Sheriff’s Department. …thats the problem with at grade lite rail lines… i wish our whole system was on dedicated ROW! Where does the money to repair the infrastructure come from? Glad the driver hit a pole instead of a train or another person/car. Don’t drink and drive, folks – ride Metro instead! Well at least Metro gained a new customer as this guy’s DL will be revoked since that’s the penalty for DUI. Eventually doesn’t Metro try to recover their losses from the driver’s insurance and/or from the driver dirrectly? This is further evidence for why the Gold Line should be grade separated along Marmion Way in the south Highland Park area. Absolutely costs for repairs should be recovered from the drivers insurance — as much as possible (and assuming the driver has insurance). If someone crashes into your car or your house, you try to recover the costs right? Should be the same thing if someone crashes into your light rail electrical pole. And I don’t know why everyone says this means rail should be grade separated… as if it’s the rail’s fault for getting in the way. You can’t just excuse drivers and say the rail line should be different because drivers are going to drive badly anyway. There are plenty of good reasons rail should be grade separated if fiscally possible, but I think using this as one tends to excuse drivers of responsibility. I was effected by this accident last night. Like everyone else, after the Kings game there were hundreds on the Pico platform. Once the PA was heard, people had no idea what to do. What Metro needs to do is actually have officials at each station directing the public where to go to get to Culver City. We got 15 different stories and no one knew anything about the status of the trains or buses until we walked to USC to get to the USC Park station, only to have 2 Metro officials tell us the trains are running from USC to Culver city. 5 minutes later we were on the train and back to CC in 15 minutes. Metro needs to have contingency plans for situations like this. Anyone else experience this?? What was that driver drinking/smoking/snorting/dropping/shooting? And as to street running, must I remind you that San Francisco has had street-running trolley and cable cars for over a hundred years? And that much of their street-run trackage (including almost the entire runs of all three cable car lines) shares a lane with automobiles? And while Chicago’s “L” is entirely on private right-of-way, they even have at-grade, unfenced, third-rail electrification, and yet somehow manage to avoid any disasters. I was not advocating grade separation at crossings. Rather for those locations where there is no real barrier in a residential area. The area along Hawthorne in South Pasadena is fine. Even without the fence it would be ok. The Blue Line running along Washington is fine (it is down a main street like the Red Cars used to go.) The area along Marmion in south HP is a problem. The train has to creep along. The houses face the road and tracks. And there is no barrier of significance keeping stray cars (much less drunks), kids, dogs, etc. off the tracks. It is a dual track where the Santa Fe had single tracks, this (along with the supports for the overhead) took away the buffer space that existed. I do not think it is the LR’s fault. But “a wise man forseeth the evil and and hideth himself: but the simple pass on, and are punished”, so to speak. Good design prevents problems, even it they are not ‘your fault’. Daniel is right. Since it started operation, not one inch of the power third-rail of the Red Line has been hit by a car. If only the Metro had the vision to see that street level train infrastructure is easily damaged. Grade-separated, dedicated ROW is the right way. Supervisor Yaraslawski said we couldn’t afford a an expensive system (Cadillac or Rolls Royce), said we would get the equivilent of a Chevy, but he/Metro gave us a Yugo (those are the death-trap cars from the former Yugoslavia). Often a fence in between the tracks is fine beacause it keeps people from trying to cross, but there I think it would have been very good to have a fence on both sides to make sure that kids, balls, animals, etc stay off the tracks. It is not a case of MTA, nor its predecessor agencies not having vision, but not having the $$$ for full grade separation or long distance subways. We are lucky we got the few grade separations we have and the tunnels at Mariachi and Soto stations. If we had waited until there was money for FULL grade separation, we would have only Red and Purple lines today, and folks who post on here would be moaning about why MTA just didn’t build LR with some grade separations, like in other cities. Those folks blame MTA is they do, or if they don’t. LR in LA is what it is. Ouch! That driver should have taken the Metro Expo Line instead of driving drunk and causing a delay to the service on the line… The driver should be fined heavily for damaging Metro property, the Expo Line should have been built either underground or as an Elevated Railway!! The train runs too SLOWLY between USC and 7th St station downtown… This is why we need a RAPID TRANSPORT SYSTEM here in LA!! Bravo for METRO’s repair personnel on the job 24/7 in all kinds of weather to keep the trains, however good or problematic, rolling.